The night ferry crossing took 8 hours to get us from Split (Croatia) to Ancona (Italy). Phil had an interesting experience boarding Nessie onto this ferry as he had to reverse all of the way –and it was at an angle of 90 degrees! He had about 4 different Croatian blokes shouting different instructions at him – I think I’m glad Phil was driving!! When we landed in Italy we drove to a site near Rimini –Camping Riccione. We were too old for this site! it did not seem family orientated to us –more for groups of teenagers enjoying their “boom boom “ music...the lads were even ironing their white jeans in the laundry room before they hit the club for the night! We wondered if there were any friendly, happy people around here – but it did get better as time went on during our time in Italy! We only stayed one night as we felt out of place and also had pitched right next to a very busy railway line. It sounded like an earth quake every time a train passed! 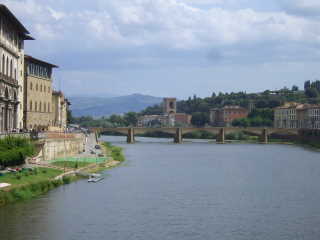 Next we moved to Tuscany (nearby Florence) and stayed at camping Village II Poggetto. Here the staff were extremely amenable and let us have a lovely flat area to set up Nessie. The children were given sweets on our arrival and we were given a bottle of wine to remember them by as we left as they were extra interested in our trip and wished us well– thank-you very much! 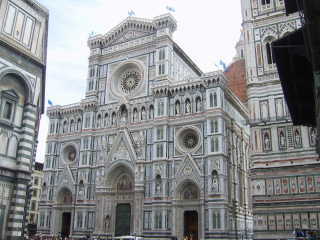 We took the bus from just outside the entrance to the centre Florence – we were very pleased with this option rather than to have to try and find somewhere to park Nessie for the day. This journey was slightly hair- raising for Phil – who much prefers to be in the driving seat -but at least there was air conditioning! 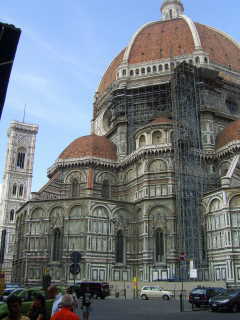 In one day we obviously did not see half of what the historical city of Florence has to offer but my Gran has spoken to Phil in the past about how she had always loved Florence, and we could see why. 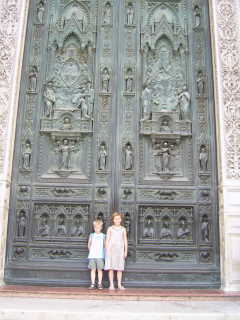 The architecture was amazing and as a capitol of the arts there were many exhibitions and museums to be seen - if we were not trekking young children with us!! We did see the amazing marble cathedral and refresh ourselves with a few mouth watering gelatos throughout the day! 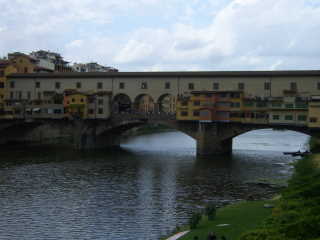 The other important feature that we saw was the Ponte Vecchio – the most ancient and characteristic bridge in Florence. The bridge, which was already in existence in Roman times might now be referred to as the golden bridge! Towards the end of the 16th century it was granted over to the goldsmiths and still today you can only find jewellers shops across the stretch of this bridge! These were the sort of jewellers where the displays are sparklingly exquisite and there were not many signs of any prices marked on these precious gems! 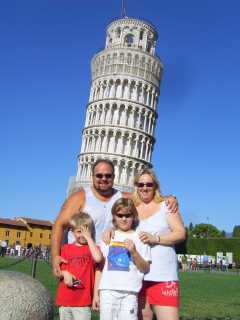 We continued our journey through Italy and stayed in Pisa. 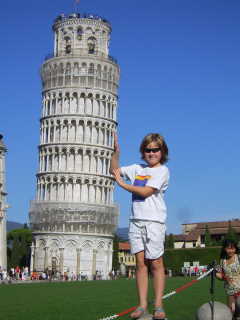 Our campsite was within walking distance of the town and was dedicated to the tower – being called Camping Torre Pendente. 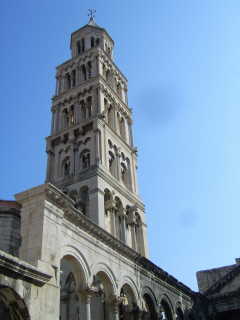 The Leaning Tower (bell tower) of the cathedral was very interesting to see and we took some very original photos of each of us holding the tower up! Works to strengthen the tower took some eleven years to complete and the tower was only re-opened to the public at the end of 2001. Our third and final port of call in Italy was back to the coast , heading towards France. 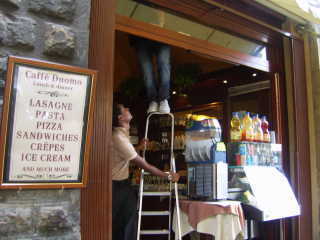 We found a lovely site again with a warm welcome – Villaggio dei Flori – in Sanremo. We had an eventful journey as we got caught up in the Genova traffic system . We were then committed to driving through the city and found ourselves on a very long bridged flyover with a maximum weight limit of 2.5 tons – (and we know Nessie weighs in at 4.5 tons)- woops! Phil was trying to keep a good distance between the car in front and the car behind us for fear of the bridge collapsing! Nessie is too heavy yet again! We wondered why there were no other lorries, caravans or campers in sight! We had to go with the flow of traffic and pray.....that no police saw us! We even had to negotiate a tunnel that was only high enough for Nessie if we kept in the middle lane and it was not lit up at all! Quite nerve racking after bright sunlight, but we managed to find our way out of the city and back onto the motorway – in the direction of Monte Carlo. The children enjoyed lots of snorkelling here with Daddy and sang and danced to Italian songs during the evening entertainments. Jemma and Ben made friends with a nine year old Italian lad and Phil was very surprised when he came to call for Jemma at 10.15pm!! When we said that the children were already asleep, he went off and returned with his mum! Luckily she was able to speak some English and we talked about our trip. When we left the next morning she came over to say goodbye and gave us a bottle of her own homemade speciality 2003 vintage wine – another big thank-you! We managed to make contact with school through Skype and it was great to see everyone back in Pyworthy and to catch up. We moved to France, as you know, and the rest, as they say – IS HISTORY! · In our experience – indicating at a roundabout or junctions is a thing of the past in Italy. · Again – in our experience – patience while at the wheel is not found in the Italian vocabulary! 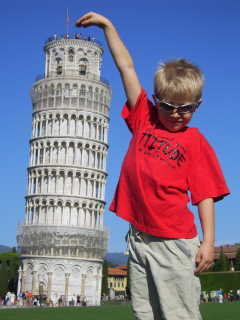 · The top of the Leaning Tower of Pisa is caught up with a helicoidal scale of 293 steps. 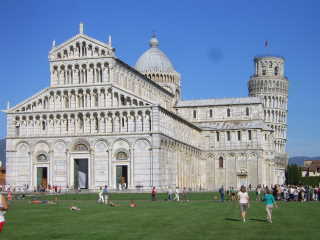 · It was from the top of the Leaning Tower that Galileo Galilei carried out his experiments around the laws of gravity. · The maximum slope from the top to the centre or the base of the tower is 5.22 M.
· An Octopus and cuttle fish while snorkelling, and swimming with an enormous shoal of small fish.